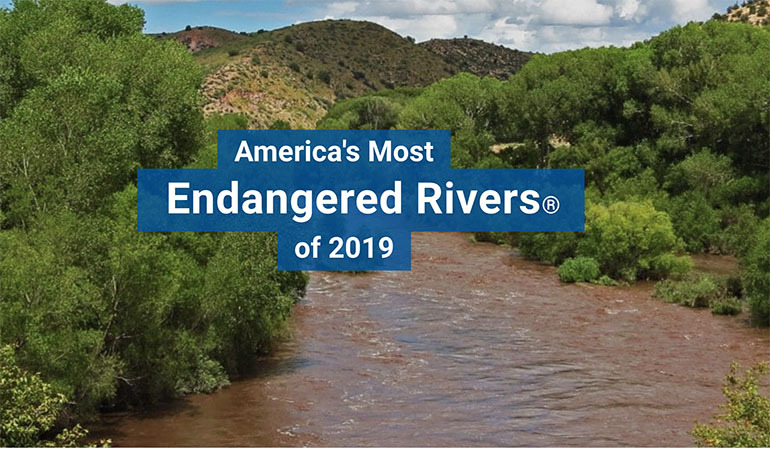 American Rivers today released its annual list of America’s Most Endangered Rivers, identifying ten rivers facing imminent threats. This year’s report spotlights the threat that climate change poses to rivers, clean water supplies, public safety and communities nationwide. #1 Gila River – The Southwest is becoming hotter and drier due to climate change. Building a costly new diversion and compromising river health doesn't make sense when there are cheaper, more effective water supply alternatives for the region. #1 Gila River, New Mexico—Gov. Grisham must choose a healthier, more cost-effective way to provide water to agriculture than by drying up the state’s last major free-flowing river. #2 Hudson River, New York—The U.S. Army Corps of Engineers must consider effective, nature-based alternatives to storm-surge barriers that would choke off this biologically rich tidal estuary. #3 Upper Mississippi River, Illinois, Iowa, Missouri—State and federal agencies must enforce laws that prohibit illegal levees, which increase flood risk for communities and degrade vital fish and wildlife habitat. #4 Green-Duwamish River, Washington—Local leaders must produce a flood protection plan that safeguards communities and restores habitat for chinook salmon — fish that are essential to the diet of Puget Sound’s endangered orca whales. #5 Willamette River, Oregon—The U.S. Army Corps of Engineers must immediately improve 13 dams to save wild chinook salmon and steelhead from going extinct. #6 Chilkat River, Alaska—The Japanese investment firm, DOWA, must do the responsible thing and back out of a mining project that could decimate native salmon. #7 South Fork Salmon River, Idaho—The U.S. Forest Service must safeguard endangered fish by denying a mining proposal that could pollute this tributary of the Wild and Scenic Salmon River. #8 Buffalo National River, Arkansas—Gov. Hutchinson must demand closure of an industrial hog-farming facility that pollutes groundwater and threatens endangered species. #9 Big Darby Creek, Ohio—Local leaders must use state-of-the-art science to craft a responsible development plan that protects this pristine stream. #10 Stikine River, Alaska—The International Joint Commission of the United States and Canada must protect the river’s clean water, fish and wildlife, and indigenous communities by stopping harmful, polluting mines.